I would like to show you the steps of how your happiness formula is created by providing some screen shots. The live site is going to be shut down, but you can recreate it on your computer if you want to. Next screen will show you historical changes in each category satisfaction vs importance. And finally, you are able to see how the world happiness formula changes because of your input, because your answers got blended into the world happiness formula. In this case, it is still just my answer, so the overall picture didn’t change. Hello dear friends, it has been seven years since the last article on this site and three years since I stopped writing for theultimateanswer.org. Due to hosting problems with hostmonster, I’m going to move all content for 4 years back here – about 200 articles! Almost 8,000 people created their happiness formula on my site, but it is time to close it down and just keep the blog. The Beginning. I was a happy child growing up in Russia. One day I heard a story about the princess of Sweden who became depressed and had to move to the United States to get better. I was very critical of her: how could you be a princess and be unhappy? If I didn’t have to worry about money I would always be happy, I thought. Life tested my beliefs. I had achieved good goals, but I still got depressed. I thought my job defined me, and, although I didn’t like it, feared losing it and never finding a job I would like. I thought the problem was with me being picky and there was no way to change it. I felt useless, without creativity, without talents, not worthy of anyone’s respect and love, easily replaceable, and about to become extinct. One day I couldn’t bear it anymore. Happiness Research. I crafted a survey to learn what makes people happy, and got some answers from the brave souls of Cambridge and Boston. I did more research and studied the teachings of some of the greatest minds of the world: Aristotle, Buddha, Omar Khayyam, Fyodor Dostoevsky, Leo Tolstoy, Victor Hugo, Martin Luther King, Viktor Frankl, Kurt Vonnegut, the 14th Dalai Lama, Martin Seligman and many others… After being totally lost at times in the pursuit of answers I finally came to understand: there are common grounds of happiness among people of different races, generations and religions. Happiness is many things! And we can all find out what they are for each of us. Happiness is subjective, because given the same conditions two people may feel differently about them and hence their happiness would not be the same. But the sources of happiness don’t vary that much. We have more similarities than differences, and that is why there are common things that make people happy around the world. Happiness Formula. Then I created the formula and tested it on hundreds of people of different backgrounds. The formula is a snapshot of our priorities vs satisfaction, while happiness units are a number reflecting how satisfied we are compared to what we want. By creating your formula you link to the world happiness formula and learn what makes you and other people happy. The most important thing is not how close you are to your ideal today, but where you are heading and the small changes you are making every day. Where you are right now may change at any moment. So don’t get attached to your formula and points today. They are just a tool to help you learn about yourself. If you are reading this, you have the courage to introspect and learn what you need to learn. When you see your formula, you will understand that to feel happy you need to either change your priorities or make efforts to raise your satisfaction. To get inspiration you can visit the library and forum, and share your thoughts and favorite quotes with others. Purpose. We will connect personal formulas into the world happiness formula and summarize human knowledge for current and future generations. With your help the Ultimate Answer will be found by all of us. How? By providing answers to people’s questions on how to live a better life and create more happiness all over the planet. We are not that different; what helped one person may help another. Negative events and obstacles can throw anyone off and make them feel insignificant, useless and not worthy of living. That is not what our lives are about. They are about learning, loving and creating. The Journey. No matter what your state of mind is, you are very valuable to the world: to the people around you as well as those who will follow. You have wisdom and experience in areas that others may lack and need help with. We need your feedback and your knowledge right now! It is about what you know and what you are willing to share. We have all done things we regret, have suffered, and have had joy that we couldn’t sustain. We all come and go, but our experiences stay with us and teach us. Now they can be part of the world knowledge, helping others to become happier and more fulfilled, and hence helping the world to become a better place. The Change. What I thought was important to me and made me happy has changed constantly over the years. My happiness varied too: some days I was happier than others… According to “Stumbling on happiness” people can’t really predict well what will make them happy in the future, they can only answer what makes them happy now… Even past happy experiences may not have the same impact on us today, because as Emerson said: “Things don’t change, we change”. Even very happy people need to know how to maintain their happiness and be prepared just in case something happens that may drag their happiness down. Will they have the right tools to bring their happiness level back? Why do we need the formula? Young people make mistakes by choosing paths that do not lead them to happiness. They often crave things they never experienced before, but believe would make them happy. They don’t have wisdom yet. Middle-aged people are busy working and raising children, possibly lacking time to think about happiness. Finally, seniors frequently look back with regrets. Though they may have become wise through a lifetime of trial and error, they may wish they had had the wisdom to make better choices such as choosing a different major or not working so hard but instead doing what they enjoyed and spending more time with the people they cared about. What if… we knew early in life what is really important? Then perhaps we would not spend so much time on trivial stuff, stupid worries, futile busy-ness, false goals, regrets, but on universal sources of happiness, applying them into our personal formulas and developing and improving them throughout our lives, following the wisdom of the Universe. What To Do. Your presence is very important. You are participating in the creation of the world brain and increasing world happiness. By helping others we increase our own happiness and contribute to the world knowledge. Create your happiness formula and see where it leads you. Participate in the forum: ask questions, because someone is about to give you the answer you’ve been waiting for; answer questions because someone needs your answer or story. Browse resources in the library or post your resources, because there are people who need them. Leave your comments, participate in the events and follow news and updates! Whatever you do, remember that you are a valuable part of the Universe, and it is finally a pleasure to meet you! 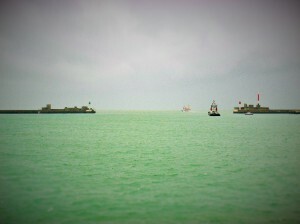 Today, still cloudy. 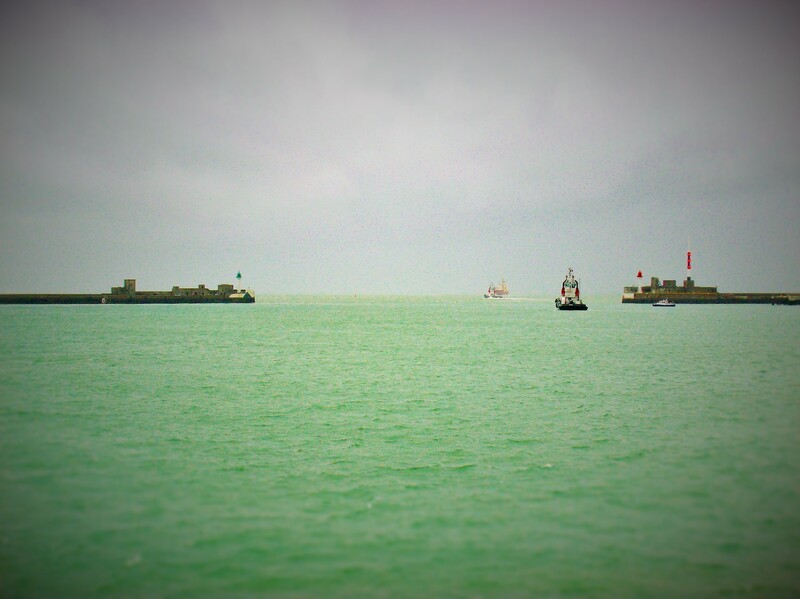 View just outside Le Havre’s wonderful MuMa gallery. 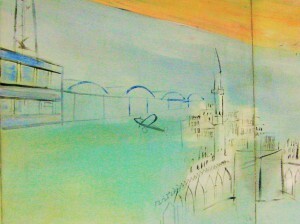 ‘My eyes were made to erase all that is ugly’said Raoul Dufy, the fabulous artist from Le Havre. That was not all he erased, as his brother Jean would learn to his horror. 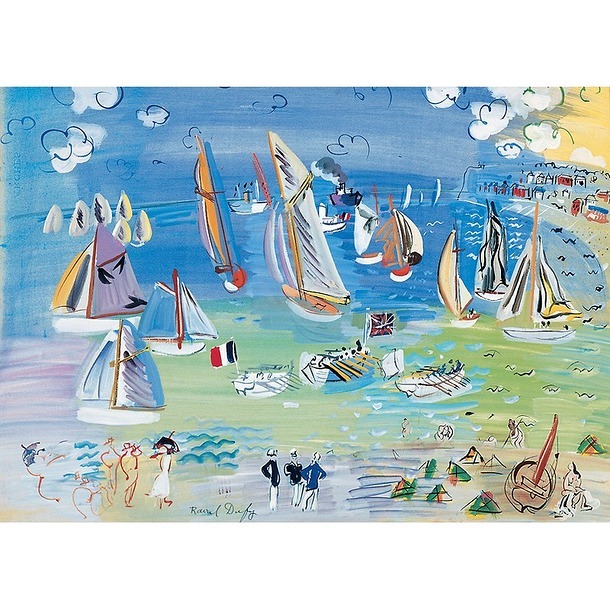 Born into a huge Le Havre family, brothers Raoul (b.1877) and Jean Dufy (b.1888) were adept at ignoring the grim and grimy of their busy hometown , focusing on sunlight and colour, as their enchanting paintings show. Le Havre was then a major port for people starting new lives in New York and New Orleans. The excitement and hope radiating from these brave travellers, their optimism for their future, perhaps influenced how the brothers saw the world. Neither started their careers as artists, or had the money to do so. At 14 Raoul, the independent eldest of 11 siblings, was working for a coffee importing company. Book comparing and contrasting the work of Jean and Raoul, plus insights into their relationship. French and English. When he was 18, aware for some time that there was more to life than coffee, Raoul took an art evening classes. As his talent was revealed his family did not discourage him, but could not support an artist. Happily as the twentieth century arrived he won a scholarship to study in Paris. 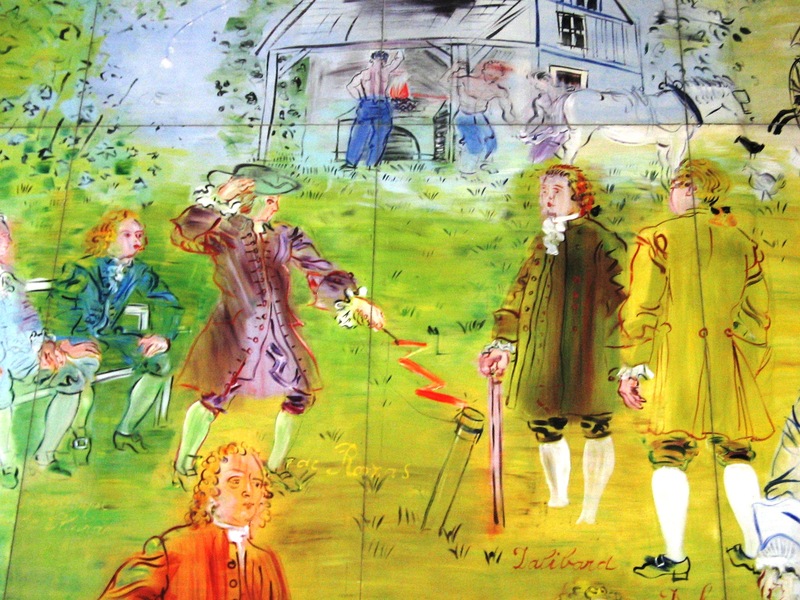 A little later Léon Dufy, the sensible father, found younger son Jean a clerks job at an import firm. Another creative soul, Jean was encouraged by Raoul to paint. Always close, by 1912 Raoul had invited Jean to join him in Paris were he soaked up ideas and influences from Durain, Picasso, Braques and Apollinaire. Plus of course Raoul, the brother he loved and admired. All progressed well for the brothers over the next few years. Raoul, established as a innovator and Fauve (art’s ‘Wild Beasts’ of colour), becomes perhaps better known but their paintings styles continue to be complementary. Both took their art beyond canvas. Raoul’s taste for beauty led him to the world of fashion and fabric design for couturier Paul Poiret. Jean’s designs for Haviland Limoges porcelain won medals and marked a new vibrant era of design for the company. By 1936 although Jean’s art is well known, Raoul is the star. 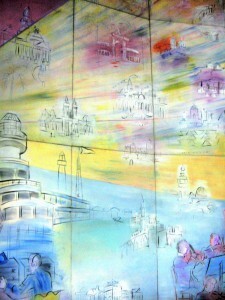 The International Exposition (World Fair) will be coming to Paris in 1937. Raoul Dufy is commissioned to create an artistic homage to the new ‘Electricité’; 250 huge painted panels to be placed against a gigantic concave wall within the Palais de la Lumière et de l’Electricité. Raoul knows he cannot complete the work on his own and asks Jean, who understands his art so well, for help to create his dream ‘La Fée Electricité’ The Electric Fairy. Jean and André Robert his assistant gave up their own work to help Raoul and ensure the mural was a success. ‘La Fée Electricité created a sensation. 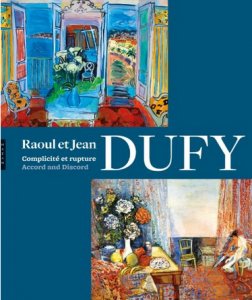 Raoul Dufy received his compliments graciously and was charming throughout the many press interviews. To this day La Fée Electricité is a credit to him. Raoul never once spoke of Jean and André’s contribution. Travelled the world finding portraits of 919 scientists and scenes representing their scientific discoveries. 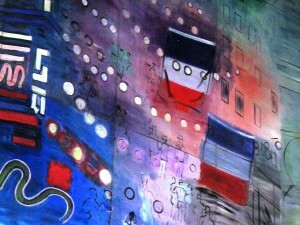 Sought guidance from a prominent Sorbonne professor on should be included in this mural homage. Dressed actors from the Comédie-Française in historic costumes, diligently sourced during his travels, to pose and be painted in the ‘master’s studio’. 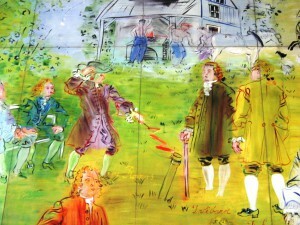 But Raoul Dufy never mentioned his brother’s involvement and Jean was not recognised for his efforts. They both continued to paint for many years. Pictures of sunshine, blue seas and happiness that never revealed any bitterness, anguish or loss. 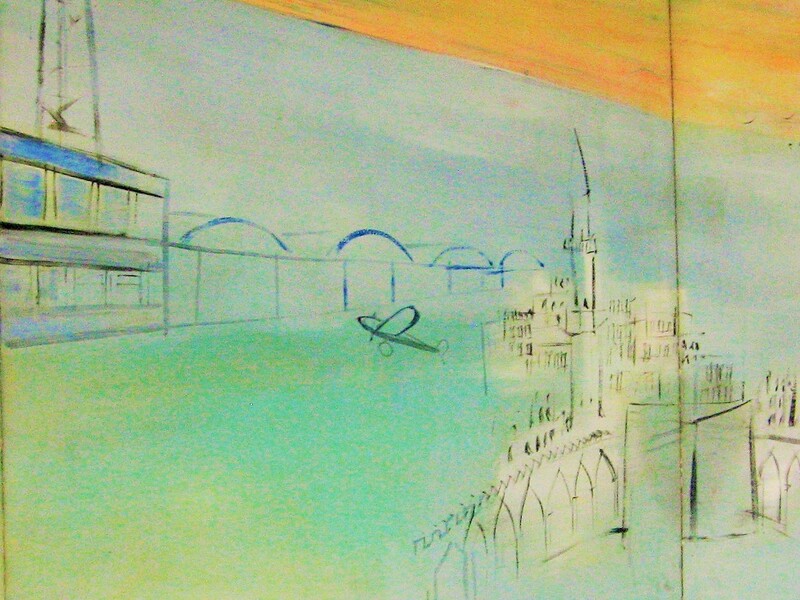 Had Raoul always thought of his brother’s art as just a poor imitation of his own? They never spoke again, so could not discuss it. 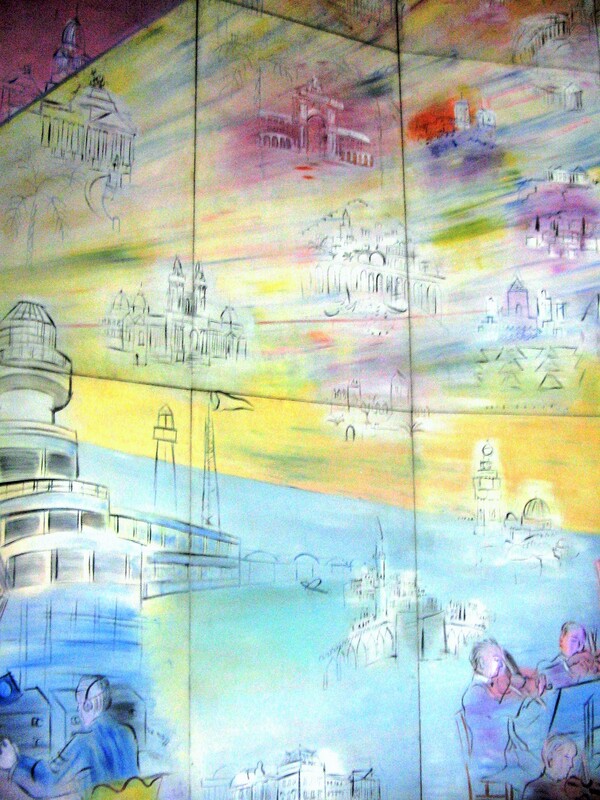 Find some time to visit the stylish André Malraux Modern Art Museum (MuMa) by the Le Havre seafront and admire Raoul Dufy’s vibrant paintings (no Jean that we could find). Watch a ‘The invisible moustache of Raoul Dufy’ (click on the illustration of Raoul at the bottom of this post). The story of his life told in a charming 1955 animation. 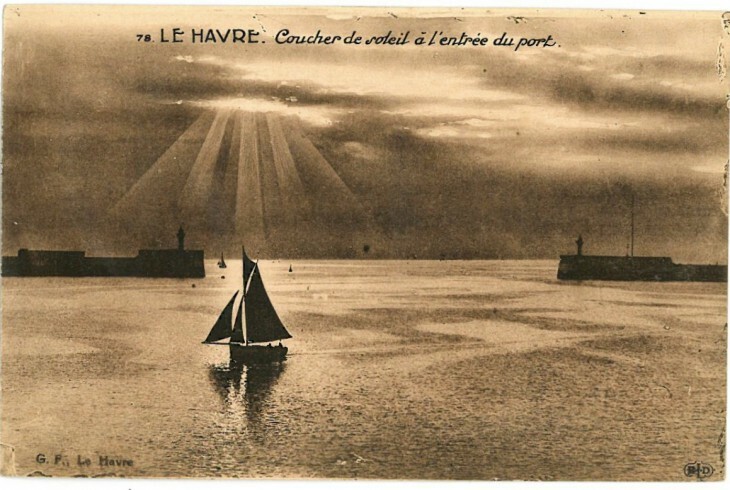 We did not expect this postcard to take us from Le Havre to Paris, but it did. Take the train from Le Havre to Paris in just over 2hrs and visit the Musée d’Art Moderne (MAM) to meet the Electric Fairy. The concept and design of this exhibition at Musee d’Orsay is based on the essay by Antonin Artaud (1896-1948), Van Gogh, the Man Suicided by Society. In late 1946, Pierre Loeb (1897-1964), founder of the Galerie Pierre in Paris, suggested to Artaud that he should write about Van Gogh, believing that after a nine-year stay in a psychiatric hospital he was eminently well qualified as an artist to write about a painter deemed to be mad. Artaud was in the process of preparing his works for publication and was not enthusiastic about the project. He was spurred to action by the publication of excerpts from psychiatrist François-Joachim Beer’s book, Van Gogh’s Demonto coincide with the opening of a Van Gogh exhibition at the Musée de l’Orangerie in Paris in late January 1947. Artaud was incensed by Beer’s clinical portrayal of the painter’s madness and challenged this analysis, accusing society as a whole of driving Van Gogh to suicide by its indifference or in order to “prevent him from uttering unspeakable truths”. “Van Gogh therefore committed suicide because the collective consciousness as a whole could no longer tolerate him”. Artaud made a brief visit to the exhibition at the Musée de l’Orangerie and drew on its catalogue and on two books with colour illustrations – Vincent van Gogh with text by Wilhelm Uhde (Phaidon, 1936) and Anne-Marie Rosset’s Van Gogh (P. Tisné 1941) – to immerse himself in the painter’s work. He asked Paule Thévenin, who was helping him with his work, to read aloud Vincent’s letters to his brother Theo. The text, made up of fragments in exercise books with revisions and improvised passages, was dictated between 8 February and 3 March 1947 to Paule Thévenin, who transcribed it. The book was published at the end of the year by K éditeur. Drawing on Artaud’s analysis and words, this exhibition adopts an entirely new approach to works by Van Gogh familiar to the poet, grouped according to his own descriptions. Let anyone who once knew how to look at a human face take a look at the self-portrait of Van Gogh […]. Painted by an extra-lucid Van Gogh, that face of a red-headed butcher, inspecting and watching us, scrutinising us with a glowering eye. I do not know of a single psychiatrist who would know how to scrutinise a man’s face with such overpowering strength, dissecting its irrefutable psychology as if with a knife”. and there you have the drama lit up. Who is going to come in? Around mid-November 1888, Van Gogh produced two paintings which form a pair: a plain yellow wooden chair with a straw seat and Gauguin’s Chair painted in red and green – colours evoking night-time passions. He explained to his brother that they represented day and night, Vincent and Paul. There is clear evidence of the tragedy which was brewing in this potent, metaphorical portrait of the friend who came to stay with him in Arles. According to Gauguin, Van Gogh threatened him with a razor a month later in a fit of nocturnal madness and then cut off the lobe of his own left ear and gave it to a prostitute. Van Gogh later admitted that “The atmosphere between us had become electric”. According to Artaud, the violet shadow suffusing the chair represented the dividing line between two antagonistic personalities. for Van Gogh was one of those natures whose superior lucidity enables them, in all circumstances, to see farther, infinitely and dangerously farther, than the immediate and apparent reality of facts”. Motivated by his hatred of doctors – and of psychiatrists in particular – Artaud stated that Dr Gachet (1828-1909) bore the brunt of the blame for Van Gogh’s suicide. He claims that this “sorcerer”, driven by a burning desire to satisfy his hatred and jealousy of this genius, urged him to paint to the point of exhaustion. However, in the final months of his life, Van Gogh regarded Gachet as a friend. He found his “gentle, sad face” so interesting that he wanted to paint his portrait as soon as they met, as a modern depiction of melancholy in which the personality of the sitter was conveyed by colour alone, rather than by physical likeness. “Van Gogh refused to tell stories in his paintings, but the marvelous thing is that this painter, who was only a painter, […] presents for us, in front of the fixed canvas, the enigma pure, the pure enigma of a tortured flower, of a landscape slashed, plowed and pressed on all sides by his drunken brush. Why do Van Gogh’s paintings make me feel as if I am seeing them from beyond the grave, from a world where finally his suns will have been the only things that spun round and lit up joyously? On 8 May 1889, Van Gogh left Arles definitively to settle in the Saint-Paul-de-Mausole hospice in Saint-Rémy-de-Provence where he was allowed outings until may 1890. When he was to feable to paint in the outskirts of the town, the Romanic monastery housing the hospital and its gardens served as his motif. His views of the hospital show a tension between the straight lines of the buldings and the moving aspect of the vegetation growing in the park. No one has ever written or painted, sculpted, modelled, built, invented, except to get out of hell. There are five versions of the portrait ofAugustine Roulin, the wife of the postman, a friend of Vincent. He started painting the first one a short time before the nervous breakdown of 23 December 1888 that provoked the internment of the painter in Arles. This icon of maternity – represented without the child – is holding in her hand the string of a cradle situated outside the frame. Behind the placid character, the flowzers of the wallpaper are swirling and seem to be animated by an autonomous and unsettling life, like a bad spell cast over the baby. For this is the essence of Van Gogh, a single-minded concern for every stroke silently and poignantly applied. The common colour of things, but oh so right, so lovingly right, that no precious stones can equal its rarity”. Artaud began drawing in 1919, the year in which he was first prescribed laudanum to ease his physical pains and anxiety. From 1922 onwards, he produced sets and costumes for his theatre projects. His association with the Surrealists encouraged him to express himself by allowing his ideas to flow spontaneously from mind to hand via a pencil which drew complex lines on paper. In 1945, Dr Ferdière, Director of the psychiatric hospital in Rodez and an exponent of art therapy, encouraged him to express himself on large sheets of paper measuring 50 x 60 cm. The big pictures sketched in colour in Rodez and the self-portraits produced in Paris in from 1946 onwards reveal the process of self-recreation initiated by Artaud to restore the fundamental unity of mind and body destroyed by his violent illness and electroconvulsive therapy. Their disjointed style reflects the power of this urge to be recreated. Some sheets are exhalations from the body, choreography of meandering shapes, apparitions and mechanical lines, reminiscent of a danse macabre, while others look like arcane alchemists’ texts. They all exude the power of a magic ritual despite the absence of linear narration. “I am […] like poor Van Gogh, I no longer think, but every day I marshal tremendous inner turmoils.” (Van Gogh, the Man Suicided by Society). Artaud’s drawings, in which lines, signs and writings are inextricably bound together, are a distillation whose meaning transcends the images depicted. “Like Van Gogh, Artaud wondered “How does one get there?” in relation not just to his own drawings but also to those produced by Vincent using broken lines, dots, cross-hatching, peaks of brown ink, coiled lines and splashes of watercolour to shape form, air and space and express a moment in life without constraining it. “Organist of an arrested tempest that laughs in limpid nature, pacified between two torments, but this nature, like Van Gogh himself, shows that it is quite ready to kick the dust from its feet. After having seen it, it is quite possible to turn away from any other painted canvas, for it has nothing more to tell us. The stormy light of Van Gogh’s painting begins its somber recitations at the very moment we have ceased looking at it. During the summer 1890, Van Gogh painted many pieces representing wheat fields in the plain around Auvers-sur-Oise. “These are immense stretches of wheat under troubled skies and I shamelessly endeavoured to express sadness and extreme solitude”, he wrote to his brother on 10 July 1890, only a few days before his suicide. “Compared to a humanity of cowardly monkeys and wet dogs, Van Gogh’s painting will prove to have belonged to a time when there was no soul, no mind, no consciousness, no thought, only raw elements alternately enchained and unchained. This is good health between two bouts of a burning fever which will abate. This is a fever between two recurrences of an outbreak of good health. This nightscape of the outskirts of Saint-Rémy is probably the last Van Gogh painted during his stay in Provence. The motifs lit by a thin moon crescent obscured by the shadow of the earth and by a star a shining as a sun vibrate as under the effect of cosmic forces, translated by swirling touches of fragmented colours. 30 March, Vincent Willem Van Gogh is born in Zundert, in the southern Netherlands. He is the eldest son of the reverend Theodorus Van Gogh (1822-1885), a Protestant minister, and Anna Cornelia Carbentus (1819-1907). At school, he learns English, German and French, and begins to draw. He begins an apprenticeship at the branch of art dealers Goupil & Co in The Hague run by his uncle. He will also work at the Goupil offices in London (1873 and 1874) and Paris (1874 and 1875). Begins a lifelong correspondence with his brother Theo. Vincent develops a passion for the Bible and becomes an assistant preacher. He is an unpaid missionary in the Borinage minefields in the Walloon region of Belgium. Decides to become an artist and settles in Brussels, where he enrols at the Academy of Fine Art. Theo is appointed manager of Goupil’s Paris office, and supports Vincent financially. Vincent settles in Nuenen, in the southern Netherlands. During this period he producesThe Potato Eaters. He briefly attends the Academy of Fine Art in Antwerp. Moves to Paris. He lives with his brother and attends the Atelier Cormon art school. Discovers the work of Monticelli. Befriends Emile Bernard, Toulouse-Lautrec and Pissarro, and meets Signac and Gauguin. He favours lighter tones and experiments with the new techniques developed by the Impressionists and Neo-Impressionists. Moves to Arles. He rents the Yellow House which becomes his studio and home. Gauguin joins him on 23 October to paint alongside him. On 23 December, according to the sole witness, Gauguin, Vincent threatens him with a razor after a violent quarrel then cuts off part of his own left ear and gives it to a prostitute. He is admitted to hospital in Arles. On 18 April, Theo marries Johanna Bonger. In May, Vincent decides to commit himself to the Saint-Paul-de Mausole psychiatric hospital in Saint-Rémy-de-Provence. Recurrent bouts of illness are diagnosed by his doctor, Dr Peyron, as ‘epileptic in nature’. 31 January, birth of Theo and Jo’s son Vincent Willem. In May, the painter moves to Auvers-sur-Oise, home of Dr Paul Gachet, a homeopathic practitioner, friend of Pissarro and modern art collector. He rents a room at the Auberge Ravoux inn. On 27 July, he attempts to commit suicide by shooting himself in the stomach and dies two days later at the age of 37.